Georgia may be the state that is most commonly associated with peach trees, but you can also grow peaches in Florida. There are varieties that are made to handle the comparatively lower temperatures of central Florida. This includes TropicBeauty, UFBlaze, Flordaprince, UFBeauty, TropicSweet and Flordaglo. They can all survive in prolonged temperatures of less than 45 degrees F. Peach trees grown in Florida should be harvested in June and July. Purchase dormant Florida peach trees that meet the chill requirement for your climate. They are available from nurseries in December or January. They are usually budded onto peach rootstock the previous May or June. Bare root trees are also harvested in the winter and need to be planted as soon as they are purchased so the root systems don't dry out. Choose a planting location that gets a lot of sun and has well-drained soil. Rich soil is best that has good drainage through the top 4 to 6 feet. Add lawn clippings or compost if the soil needs to be amended. Dig a hole that is wider and slightly deeper than the root mass of the nursery plant. Place the peach tree in the center of the hole and fill it in halfway with soil. Water it thoroughly to get rid of air pockets. Continue filling until the soil level is just below the surrounding ground. Water the soil again until moist. Keep 3 to 4 feet around the base of the peach tree weed-free. Water the tree once a week during the growing season. Water until the soil 1-inch down is moist. Apply 1 pound of a 10-10-10 fertilizer to peach trees in Florida in May of the first season. Each February in subsequent years, feed the tree 1.5 pounds per year of age. Cover the entire ground beneath the branches with the food, then water to help it reach the root system. Train young peach trees to form a solid structure during the first two or three years of growth. The goal is to shape the tree like a vase. Cut off most lateral branches, leaving three to five in place--one facing each direction. Trim 2 to 3 inches off the ends of each of the remaining branches. Prune peach trees during the dormant season, which is December to February as well as in late spring and summer. Remove branches that are weak or damaged, as well as those that are crossing or rubbing against each other. Thin blossoms in early spring, leaving one blossom on every 4 to 6 inches of branch. This will promote the growth of more peaches. Avoid planting locations that are prone to flooding. Do not plant peach trees in Florida in a location near pecan or plum trees because they may cause disease. 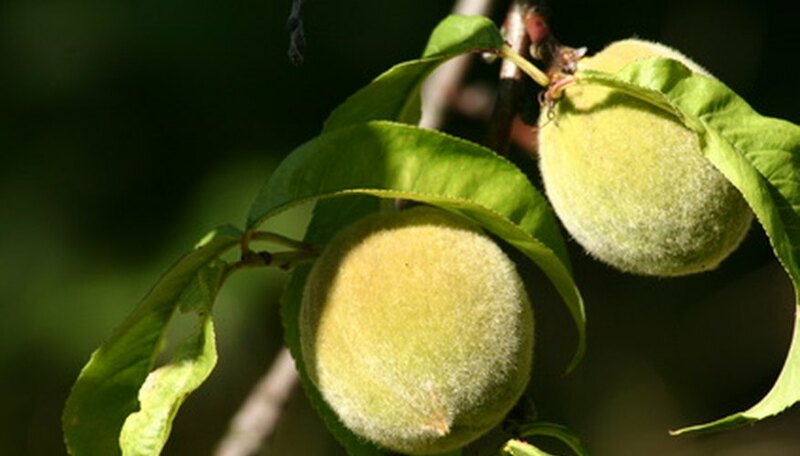 Flagler County Extension Service: Peach Trees in North East Florida? What Are the Types of Peaches in Georgia?